Hundreds feared dead as ferry capsize on lake Victoria. HomeAfrica FocusHundreds feared dead as ferry capsize on lake Victoria. Hundreds of people are feared missing after a ferry capsized on Lake Victoria in north Tanzania. A local official told the BBC five people have died and 102 have been rescued, but another said that the vessel was overloaded with more than 400 people on board. The MV Nyerere ferry overturned near the shore between the islands of Ukora and Bugolora. Locals have joined with emergency teams in rescue efforts. 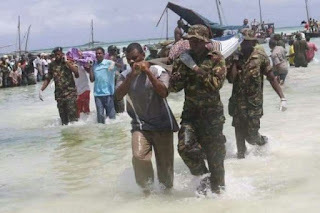 The Tanzanian government has confirmed the ferry capsized but exact figures for those on board are yet to be confirmed. Accidents are common on Africa’s largest lake, Victoria, where boats often depart overcrowded.